This book, just as the name implies, was written to present and explain the complicated world of Internet/networking in easy-to-understand words. The book allows the reader to quickly get familiar with various topics concerning networking, such as security, wireless, VPNs and many more, due to its clear language and plenty of supporting graphics. Available for download sample chapter number 9 – “Security”. Paul Della Maggiora, CCIE No. 1522, is a manager for the Cisco Systems Enterprise Solution Engineering Group and developed their Networking Bootcamp for new Cisco TAC engineers. Paul participated in network management product development as well as multiple customers´ network designs and assists Cisco customers with managing their Cisco network from an in-depth nuts and bolts perspective. Jim Doherty is a Solutions Marketing Manager with responsibility for routing and switching for Cisco Systems. He has taught professionals in both academic and industry settings on a broad range of topics including electric circuits, statistics, economics, and wireless communication methods. Jim also authored the Study Notes section of the Cisco CCNA Exam #640-607 Flash Card Practice Kit. The book consists of seven major parts each one of them covering a specific network technology or concept. The first part begins with a brief overview of the OSI (Open System Interconnection) model and the Internet. In continuation, TCP/IP protocols and other networking fundamentals are explained. The authors also discuss Internet applications such as e-learning and peer-to-peer sharing. By the end of this part, the reader must have obtained basic knowledge of networking and how the Internet works. After having explained the basic concepts, authors dedicate the rest of the book to further exploration of the vast networking world. The second part deals with enabling of traditional functions such as video conferencing, telephony etc., upon IP networks. Topics such as IP Telephony, Voice over IP (VoIP), IP Multicast, video conferences are covered in this part with the explanation why and how these activities are possible via the Internet. Network security is the subject of the third part of the book, which is broken into five topics. Naturally, the first one explains what the network security is and why it is essential. It also covers authentication, 802.1x standards and RADIUS. Moving forward, the reader gets familiar with various types of hacking attacks and how they impose threats on networks. The next two topics explain the technologies that are used to keep networks secure – Firewalls and Intrusion Detection Systems (IDSs). And finally, the last topic provides a brief overview of cryptography: DES and 3DES algorithms and Diffie-Hellman key exchange system. The fourth part covers data-flow in networks. This part gives a short summary of the Ethernet and its evolution since mid-seventies. Moving forward, the reader is introduced to Local Area Networks (LANs), switches, hubs, bridges and routers. The part is concluded with an explanation of the modern Wireless technology. In the last three parts, the authors change direction and explore network utilization and maintenance. In the fifth chapter, the reader learns what is considered a “disaster” and how to recover from it, how to design a high-availability network and minimize downtime, basics of network management and troubleshooting, elements of Quality of Service (QoS) and packet-flow across a network. In the next chapter, the reader is introduced to hierarchical network design as well as to optical and broadband (cable, DSL, ISDN) technologies. The business aspects of networking are covered in the last part, which is dedicated to data centers, Storage Area Networks (SANs) and caching. 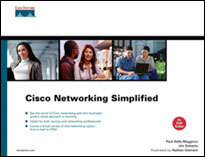 “Cisco Networking Simplified” provides a comprehensive and easy to understand guide to basic networking concepts and technologies. The authors did a great job explaining complex technologies in a very clear but not simplistic manner. The way the book is written – from general ideas to detailed designs – makes it easier to understand each section. This book is a great asset for people who are making their first steps in the world of networking. On the other hand, it could be very helpful for the senior managers that need to catch up with the current networking technologies and trends in order to keep pressure on their IT guys.